Owner. Fearless Leader. Captain of the Ship. 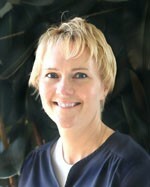 Dr. Drost-Sandy graduated from the University of Iowa College of Dentistry in 1997. Go Hawkeyes! Since then, she's stayed on top of the best dental practices and technological advancements to provide each patient with a great experience. She is tirelessly working on one patient at a time to undo the fears instilled from previous visits. She is passionate, hard-working and down to earth...seriously, all the qualities you want and need in someone you trust with your smile. When she's not "drillin & fillin", she's "meetin & greetin" guests at the fishing resort her and her pro-fisherman husband own and run during the summers. In the winter, Dr. Drost is an avid "Hockey Mom" and spends her time in arenas across the state cheering on her two daughters. She loves being involved in the community, watching hockey and out-fishing her husband. Trust us; she's as cool as she sounds!